If you've noticed a drop in the frequency of posts this week it's because I've got a book in the works, and I've had to lose myself some research for chapter on space combat (I may well publish a small part of it as a blog post). So my apologies for that - but there will be something interesting coming out of it in the near future, I promise! We also have part three of 'Homes in space' coming up, as well a a look at some of the strange stuff fire does in microgravity very soon, so stay tuned! For right now... let's have look at the Sun*. It's the source of the energy that powers all (well, 99.9%) of life on Earth, and it's a natural fusion reactor that can teach us how to build our own - so it's not surprising that space agencies spend a lot of time studying it. 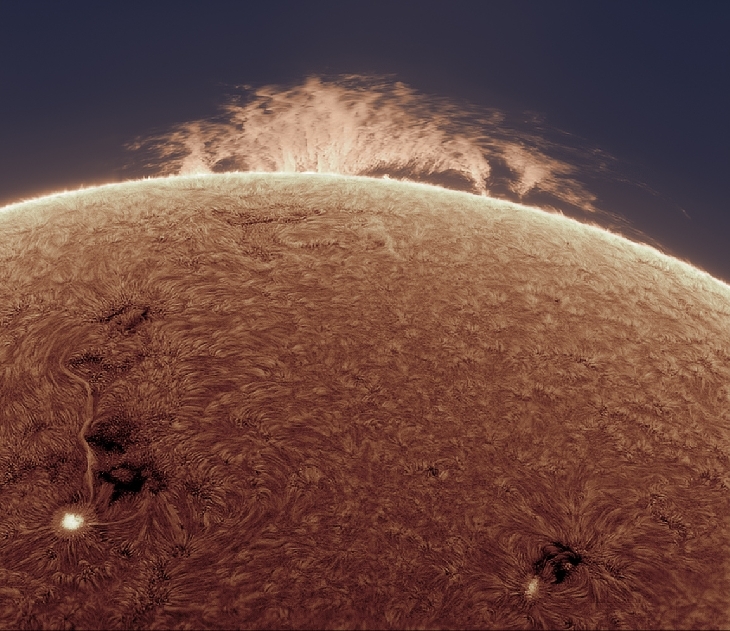 Above: The complexity of the Sun's surface, as seen through about a zillion protective filters, on a computer screen. Don't ever look straight at the Sun, especially with a telescope - not blowing up your own eyeball is sort of an unspoken first test for being an astronomer. Image courtesy of NASA. Above: Some of the strange phenomena discovered on the Sun. Courtesy fo UCLAN. Above: A massive coronal hole. Video courtesy of Space.com. It's fifty times as wide as the Earth, and like most of the strange holes, is associated with solar winds of hundred (sometimes even thousands) of kilometres a second. It's exposed the solar surface, and you can see how the super heated gas that makes it up flickers and dances as the forces of heat, gravity, and magnetism fight each other. * Don't actually look at the Sun, especially not through any kind of magnifying device, because your eyeball will get cooked - and I don't mean meterphorically.